Songs with Soul, Singers with Style! In this all-new AMT Original Show, our cast of multi-talented performers will celebrate the most popular and enduring songs from the 1920s through the 1950s, along with recent hits from today’s modern, soulful musicians. Join us on a five-star musical journey and travel from the legendary evenings when classic crooners owned the radio, to today, when the soothing sounds of our contemporary crooners still help us to escape our stresses and soothe our spirits. Experience the satisfying, serene sounds of these larger-than-life entertainers with American Music Theatre’s 2016 Show: Crooners! 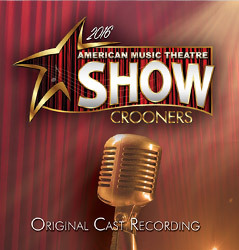 Take home your favorite Crooners songs performed live by the AMT Cast & Orchestra in stunning CD quality. Available for sale in the AMT Gift Shop, and in the lobby during select performances. Seth is thrilled to make his AMT debut in Crooners. Seth was born and raised in Lancaster County and has been performing in the Lancaster County area for the last 15 years. Past credits include Forever Plaid (Frankie,) HMS Pinafore (Boatswain, Servant Stage Company,) Passion the Musical / Sermon on the Mount the Musical (St. Peter, Piercing Word Ministries,) and Les Miserables (Babet, The Fulton Theatre.) Special thanks to family, friends, and the cast and crew of Crooners! Soli Doe Gloria. Kyle completed his Bachelor of Music at The University of The Arts (Philadelphia) in 2009. Following his studies, he relocated to The Netherlands and enjoyed a successful and diverse entertainment and performance career throughout Europe. Kyle is now thrilled and grateful to be back home in the United States, and to make his debut with AMT! Ashlee enjoyed making her debut with AMT during The 2015 Christmas Show: Deck the Halls. She gives credit for her dance ability to the years of training with Hanover School of Ballet. Included in Ashlee’s favorite credits is a solo performance singing the blues at NYC’s Birdland. She thanks PopPop for always being her chauffeur. Brandon is excited to be returning to the AMT stage in Crooners, having previously performed in the Christmas Shows since 2013. Brandon has also locally performed with PRiMA Theatre, Servant Stage Company, and Sight & Sound Theatres, and plans to pursue a college degree in the Arts. Thanks to God, his family, Andrea, and the entire Crooners cast and team. Missy is thrilled to be back for another season here at AMT. Missy graduated from the American Music and Dramatic Academy in NYC where she studied musical theatre and dance. Previous regional credits: Rock of Ages (young groupie,) Legally Blonde (Brooke Wyndham,) Chicago (Liz,) 42nd Street (Lorraine,) and A Chorus Line (Kristine.) All my love to Mom, Dad, and Max. For my Grandparents! Wess is happy to be returning to AMT for his 15th year. He attended Shenandoah Conservatory of Music, has opened for many artists, and worked at other theatres prior to joining AMT. Originally from northern Virginia, Lancaster is now home. Purchase original music at www.WessCooke.com and make sure you catch his September 11, 2016 show here at AMT! Isaac started his training under the direction of Ms. Sandra Ballestracci, at the Eastern Virginia School of the Performing Arts. During his training, he also performed at Busch Gardens Williamsburg. He then went on to board the M.S. Zaandam, a part of Holland America Cruise Lines. Following his time at sea, Isaac then joined Dublin Worldwide Entertainment. While with the company, he performed in numerous casinos throughout the U.S. and Canada. Isaac is very excited to be back in Lancaster for his second season at AMT. Joshua is thrilled to be a part of the cast of Crooners, marking his AMT debut. Joshua studied theatre at Pensacola Christian College, in his native state of Florida. Having spent years as a resident performer at Sight & Sound Theatres, he portrayed many biblical, bearded characters, including the title role in Joseph. Other credits include Chess (Freddie,) Seed of a Nation (Andy Kelly,) Little Shop of Horrors (Seymour.) Eternal gratitude to Andrea for this opportunity, and much love to his friends and family who sustain him. For Connor Joseph, change the world buddy. Crooners marks the start of Julie’s seventh season at AMT, and she is happier than ever to be a part of this musical adventure. A McDaniel College grad from Waldorf, MD, Julie has lived in New York, Tennessee, Maryland, Virginia, and aboard Celebrity’s GTS Summit before making Lancaster her home in 2009. To hear some original music, search her on CDbaby or iTunes. Love to Jacob and family, and to her wonderful AMT family! Kayla is excited to perform at AMT for the first time. Kayla received a B.A. in Music Performance from Millersville University. Credits include Children of Eden, Oz in Concert (PRiMA Theatre,) Urinetown, Anything Goes, Thoroughly Modern Millie (PPAS,) Pirates of Penzance (Mabel, Millersville University,) and several shows with OperaLancaster. Meghan is excited to be back for another AMT Original Show. She has been seen in the AMT Christmas Shows since 2010. Meghan currently dances at Morton’s Dance Center and takes voice from Rebecca Auchenbach. Thanks to her many mentors who have contributed to her success, including Andrea, Missy, Elijah Morton, Renee Censier, and Carol Still. Love to her family and friends who have supported her over the years, especially her Mom. Rachel is excited and honored to join the cast of Crooners. Rachel received her formal training from Gloria Frances School of Performing Arts. Credits include: traveling the world performing on Holland America Line, a featured dancer for Dancing with the Stars at Sea, Hot Jersey Nights, Christmas Wonderland, Carnival of Magic, Hersheypark’s Livewire, Divas Through the Decades, and Crazy For You (Margi.) Assistant choreographer for BerganPAC’s Fame. Special thanks to AMT for this opportunity as well as family and Fraser for all your love and support. Erin Mary is grateful to be part of Crooners. Her favorite roles include The 2011 Christmas Show (Little Girl,) White Christmas (Susan Waverly,) Cat in the Hat, Seussical, Jr. She is a freshman at Lancaster Catholic HS. Erin Mary has been singing since she could talk and dancing since she could walk. With love and gratitude to God, family, friends, and teachers. Erin Mary is blessed to have her grandparents always in the audience. Special thanks to Andrea, Missy, and Matt who continue to inspire. Corey is very excited to dance in AMT’s Crooners. Corey most recently performed in AMT’s 2015 Christmas Show: Deck the Halls and Inspire where he was the lead male dancer. He has toured with The Aluminum Show in Brazil and Spain and with The WOW Show in Israel. Corey performed in production shows on Royal Caribbean’s cruise ships and danced for some of today’s biggest artists. He has been published in many magazines and recently appeared as a contestant on MTV’s Beyond Dance. Corey wants to thank his family for their support. Check out www.coreyobrienonline.com and follow @corey_obrien for updates. Enjoy! Jessica is so excited for her first production at AMT. Jessica, a graduate of Millersville University, has appeared in several shows at the Ephrata Performing Arts Center. Favorite past credits include Anything Goes (Erma) and Xanadu (Erato.) Jessica would like to thank her mom Linda, husband Dave, and son Jack for all their love and support. Lauren is thrilled to perform in her eighth production at AMT, after appearing in Broadway: Now and Forever, Music of the Night and five Christmas Shows. She has performed locally with PRiMA Theatre, Servant Stage Company, and Lancaster Bible College. In addition, Lauren has performed with the Annie Moses Band at Carnegie Hall, Cannery Ballroom, and the Grand Ole Opry. Lauren gives all glory to Christ, and thanks Andrea, Missy, and Matthew for this opportunity and her parents for their enduring encouragement. Michael is very pleased to be joining the AMT Orchestra for the 2016 season. He has been performing and teaching in the Philadelphia area since graduating from Kutztown University in 2010. He attributes much of his musical development to studying with legendary bass players including Scott Lee, Buster Williams, and Kevin MacConnell. Michael’s professional career spans a wide variety of musical endeavors including extensive pit orchestra work, jazz ensembles, operas, wedding bands, and rock, pop, and funk groups. Mark is happy to be back for another season at AMT. As a veteran of local theater and jazz clubs, he’s been seen manning keyboards/piano at countless venues throughout the region. His recent AMT shows include Music of the Night, American Icons, Broadway: Now & Forever, The 2012, 2013, and 2014 Christmas Shows, and Inspire. Mike has a crazy enthusiasm and passion for music, and being able to share that with the world means everything to him. He’s thrilled to be back this year and hopes you’ll follow him on Facebook for all the latest info. As a professional musician, John has performed with over 100 headliners including Ray Charles, Robert Goulet, Bob Hope, Bobby Vinton, Dolly Parton, Barbara Eden, Helen O’Connell, Margaret Whiting, and Rosemary Clooney. His performances include scores of National Broadway touring companies. John recently retired from teaching Low Brass at Millersville University and is currently on staff at Lancaster Bible College teaching trombone. Andy is a graduate of Berklee College of Music in Boston and currently lives in Central PA with his wife and daughter. He is very active in the music scene around the Central PA and Philadelphia areas. Andy has been music directing for AMT since 2010. He’s happy to be part of this tribute, along with his AMT friends, to some of the great voices and music that have been so influential to our American culture. More information about Andy can be found on his website, www.antigravmuzik.com. David is delighted to be part of Crooners here at AMT. Playing credits include Kristin Chenoweth, Natalie Cole, Aretha Franklin, Frankie Valli, Bob Mintzer, The Jaco Pastorius Big Band, Dave Stahl Band, and many others. Touring Broadway show credits include Grease, A Christmas Story, Hair, Spamalot, Legally Blonde, Chicago, and many more. Aaron, a 2011 Lebanon Valley College graduate, is excited to return for a third show at AMT. He is a freelance musician and an avid artist, songwriter, and designer. Aaron credits his accomplishments to his mentors including his grandmother, Dorothy Homan, his family, David, Lisa, and brother Benn, and his lovely wife, Kathryn, for always supporting his dreams. He would also like to dedicate this show to the passing of a good friend and fellow bandmate, Chris “Buzz” Deardorff, for his commitment to loving everyone.